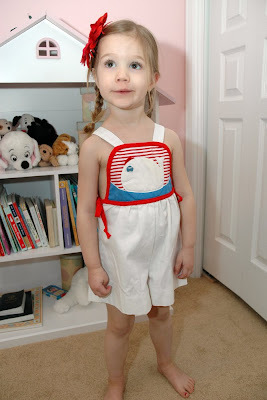 Krista's mom recently found an old outfit that Krista wore as a toddler. We thought it would be fun to take a picture of Ava wearing the same outfit. 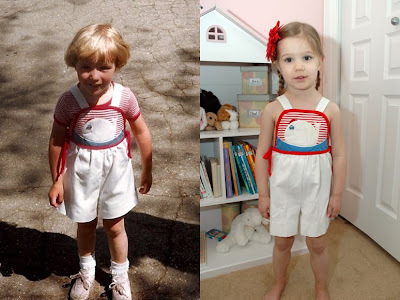 We explained to Ava that she was wearing an outfit that her mommy also wore as a little girl. This got Ava really thinking. Now she constantly talks about "growing big" someday. However, we would like for her to stay our little girl for a while longer. Ava is a real cutie pie! I loved seeing that old picture of you, Krista! Boo, you look exactly the same! Ava doesn't really resemble you...she must have a lot of Lar-Bear in her :) What a cute little oufit too. Cute...and she looks like she really likes it too!! Krista you're adorable...and still are just as cute!!! Haha that's funny. My mom saved some three year old outfits and gave them to me too so I'll have to try them on Abby when she's big enough. I put a pair of Ryan's six month old overalls on her that were red and said "Ryan" but the effect was kind of weird since he is a boy so it was not blogworthy.